Presented by: Goh Ballet Inc.
Be enchanted by the timeless fable of a young woman overcoming all odds to find her courage and true love’s destiny. 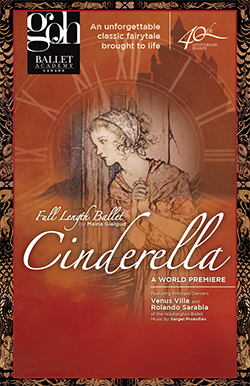 A balletic fairytale of love, hardship - and a lost slipper! Featuring Principal Dancers Venus Villa and Rolando Sarabia courtesy of the Washington Ballet, set to the music of Sergei Prokofiev, with original choreography by Maina Gielgud, video set design by Jamie Nesbitt, and costumes by Deb Basterfield and Maryam Asgari.